Right there, we were lucky enough to meet Daniela. The matching was instant & after half an hour of introductory talk, we invited her to travel together to nearby Guatapé, sell our stuff together and get to know us better. For the next 3 days, we came closer and we introduced Daniela to the traveliving concept. On the other hand, Daniela shared with us lots of interesting stuff about her country. Daniela is a hand-crafts travelling vendor & graphic designer. 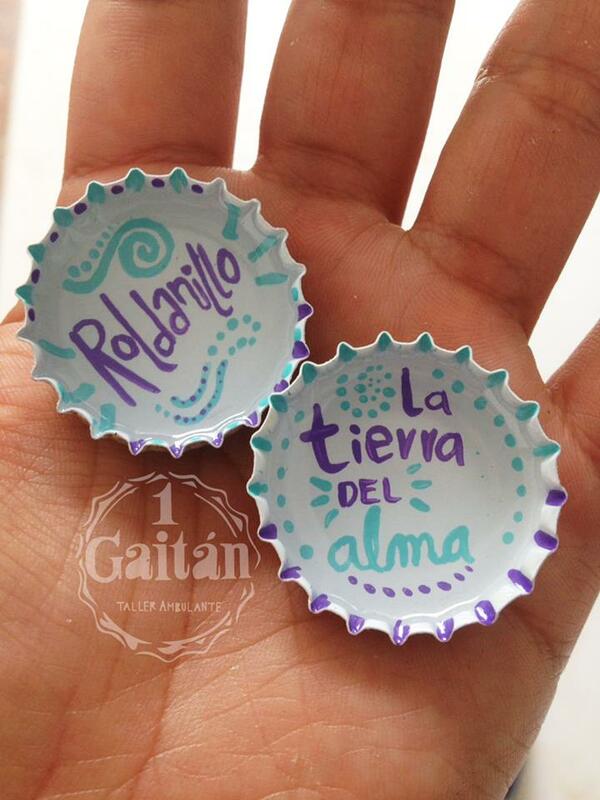 1 Gaitan* is the name of her collections. Daniela is the most smiling Colombian we have met in our 3 month stay as well. She does lots of amazingly creative crafts & designs but her specialty is the resin-filled flower-topped beer cans. Oh my God! They are so beautiful. After 3 days of travelling, we split but Daniela invited us to her house in Roldanillo. We did not miss the chance and paid a visit to her family house in a later stage on our way to the south. We die for cultural exchange that begins pretty much like this and Daniela’s family did not let us down. On top of their hospitality, the coming weekend, they had scheduled a family reunion and guess what; we were invited! Two days full of Colombian food, salsa and muchos Colombianos! What else to ask? Mission accomplished! Another real friend (not in the Facebook list) was added in our long list, another local family tasted mousaka** but, most important, another house opened its doors and for as long as it lasted, we had a proper family (this is what we miss after 5 years of non-stop travelling). This is what we call traveliving. This is why we travel. Thank you all for being part of this trip. *: Jorge Eliécer Gaitán is featured in the 1000 Colombian Pesos bank note. When Daniela started selling her crafts in the street, people were asking the price & she was replying “It’s 1 Gaitán“! **: After 7 or so visits in local houses, it has become a ritual for us to cook our favorite Greek dish of mousaka (or μουσακάς) for the families they invite & hosts us.